For a long time I've kept a collection of MP3 files and other audio formats on a NAS device, organizing selected titles in iTunes but keeping the files off my system. Now, I'd like to copy them to my local system. Dragging all the files to my "Music" folder is the obvious choice, but it made me wonder, what exactly is the difference between dumping a bunch of files into a sub-folder under "Music" versus just putting them in some random location within my home directory? Are they indexed differently? Do apps see them differently? Or are loose (i.e. moving them around doesn't break anything) files in "Music" treated like files I have anywhere else? You can put the 'root' of the iTunes Media directory, "iTunes Music", where you like - though personally I prefer to keep all the actual database files in their original location & just move the song files themselves. This is quite possibly the setup you currently have. To move it anywhere else, the simplest way is to change the directory in iTunes prefs > Advanced to the new desired location. It's been a long time since I did this, so the next step may be automatic or manual - test to see. 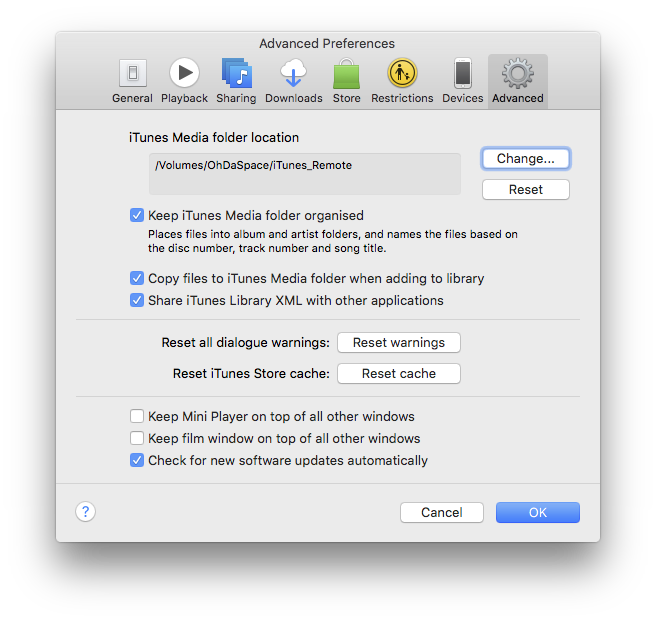 Auto - when you OK that dialog iTunes will ask you if it can consolidate to the new locations; say yes. Manual - if it doesn't ask, then from File menu > Library > Consolidate files to have it do the same manually. This will copy all the song files it is currently keeping track of into the new location - & will then always use that location whenever you add new music. Note that in my example above iTunes_Remote is the top level directory; inside it iTunes will then make the required folders for Audiobooks, Movies, Music, etc, as needed. Simple answer, there is no difference where a file is that will make it any different based on placement on the computer. The reason you have a "Music" Folder on the mac is just for organization. An already created folder for you to easily place all your music in. Placing your music into the Documents, or Downloads folder will still make the playable by any Music player application. However there is a benefit for having mp3 files in your Music folder because iTunes looks in that directory automatically for files to add to your library. 1) Are they indexed differently? Define 'indexed'.. They aren't treated differently if that's what you're asking. 2) Do apps see them differently? No, but iTunes does look in the Music folder for playable files and nowhere else on your system. 3) Loose files? Like I said above, any file anywhere on your system is still the same file 'type'. It doesn't matter where it's located. It doesn't make it something else due to placement. Again, those directories are intended for organization. tldr; put them into your Music folder for iTunes to quickly find the files. Not the answer you're looking for? Browse other questions tagged itunes finder music mp3 . Add MP3 Files To Native Music Player? Is there any way to move the itunes files (not just the music library) to another folder?